As with many great things like sliced bread or organic food, the idea behind functional test automation is simple: let’s have the computer drive the application-under-test, enter data, and compare outputs to the expected results. After all, performing a task over and over again quickly and in exactly the same way is exactly what computers are so good at. Test automation is supported by several tools. There are numerous experts who have deep knowledge and extensive experience in using these tools. However, it is not the tool and even not the test automation that you want – you are looking for a solution to a certain problem: shortening the test cycle time, improving the reliability of testing, allowing tests that are based on data generated on the fly, etc. Conflair creates Test Automation solutions to fit your needs and to answer your objectives. There are two main benefits one could expect from Test Automation: reliability and time savings. 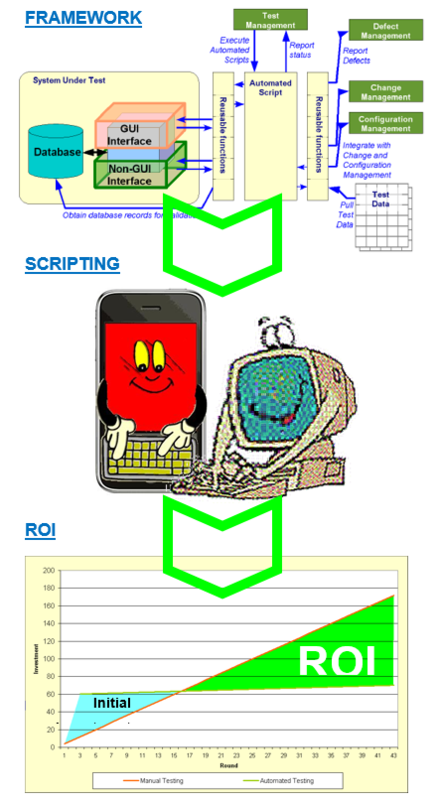 Automated scripts will never fail to compare 17-digit numbers or ten-page texts. Good automated scripts run faster than the human tester, thus allowing more tests to be executed within the same timeframe, saving resources and shortening test cycles. Test Automation is a complicated undertaking. It requires much more than knowledge of this or that tool: expertise in testing, strong yet flexible methodology, deep understanding of different technological environments, and lots of creativity. Conflair can offer all these and more. Our experts have expertise in test automation, are equipped with solid methodology, and are familiar with different technologies and their respective automation solutions. The scripts are not the only deliverable – our goal is always to build an automation framework that will consistently provide you with test automation support you need. We have automated tests for a variety of applications and platforms, form Windows, web, and mainframe to smartphones, tablets, and ruggedized devices. Conflair has developed a unique method for automating tests for mobile devices – RealMobileTM, a method that allows you to use regular industry standard test automation tools to automate tests for a variety of mobile platforms: Apple’s iOS, Androids, Windows CE, and more. Test Automation can be a big saving or a wasted investment. Conflair’s expertise makes the difference.